Founded in 1988, ACE Rubber Products, Inc. is an industry leading provider of custom rubber molding services and is committed to embracing the latest technologies and material advances for injection, transfer, and compression molding. Ideal for higher volume projects, our injection equipment is capable of 300-500 tons of force and handling shot sizes up to 15 lbs. For smaller production runs, our compression presses, which feature a ram diameter of 6-36", are capable of manufacturing parts with dimensions of up to 42" in length and width and 40" in diameter. We have proven expertise for working with a number of different materials, from natural rubber and silicone to a long list of synthetic elastomers with durometers ranging from 20 to 95 Shore A hardness and temperature resistance from -100°F to +500°F. We can help choose the best materials to deliver the specialized performance characteristics your job requires, and Mil-spec, FDA approved, and UL listed formulations are all available. With tolerances that meet or exceed published RMA standards, we produce consistent, repeatable results, first part to last, one order to the next. Family owned, we operate with agility and react quickly to changing customer demands. Our client services staff is courteous, responsive, and committed to ensuring on time deliveries of your valuable components. We offer many additional services, including reverse engineering, tool design, as well as finishing options to meet your start-to-finish production needs. 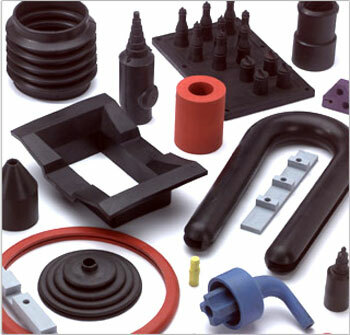 Contact us today to learn how our custom rubber molding services can benefit your next project.